Call of Duty's first downloadable content has hit the Xbox One today, bringing with it some maps the competitive folks should enjoy and a chance to soak in the sound bytes of four prominent actors while shooting mechanically-pulled zombies. That's my jam. Warning: Call of Duty: Advanced Warfare story spoilers ahead. First off, I just typed out "Call of Duty: Advanced Warfare story spoilers" with a straight face. 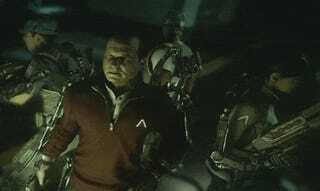 Lacking the sort of complex motion capture technology required to scan John Malkovich, Jon Bernthal, Rose McGowan and Bill Paxton's heads into the first installment of the new Exo Zombies co-op mode, you'll just have to take my word. "Call of Duty: Advanced Warfare story spoilers." Okay, that time I laughed. At some point in the storyline for the main game a biological agent is released by some giant evil company I'll not mention to avoid spoiling it. The agent is supposed to kill non-employees of said company. Instead it turns everybody at the company's headquarters into a zombie. Everyone except for a security guard (Bernthal), a Rose McGowan, Bill Paxton as your dad and John Malkovich as the foul-mouthed janitor with a heart of gold. You may have seen last week's story trailer. Here is the full intro for the game mode's first installment. So we've got four unlikely heroes versus 25 waves or so of zombie madness. First we get regular zombies. Then zombies with extra cheese. Then fast zombies with exo-suits, infectious zombies that will turn players evil unless they decontaminate, dog zombies because you need those, exo-suited zombies with electrical shorts making them all glowy and hurty and much, much more. At least I assume there's much more, I've been having trouble getting past wave 10. For those of you who prefer the single-player experience, you can play the Exo Zombie mode locally with or without a friend. It's an excellent way to listen to John Malkovich's one liners without distraction. Note that this is my first round, and I don't get very far. The idea here is to spend your money to unlock new areas, weapons, exo-suit powers and upgrades. The idea is not to just run around listening to Malkovich until you die. If you are going to play solo, pick someone far less interesting, like Bill Paxton. His character, Mr. Kahn, is pretty much your dad. And my dad. Everybody's dad, Bill Paxton. I found myself rooting for the zombies. It doesn't really matter, as the character you're assigned is random. Probably should have mentioned that earlier. The real fun comes from playing with other people — that's what co-op is all about. And while the action is less structured than my beloved alien co-op from Call of Duty: Ghosts, the spirit is essentially the same. The upgrading weapons and unlocking new areas reminds me of the escalation co-op mode from Transformers: War for Cybertron, which is about as reverse a comparison as you're likely to see. Either way, the first installment of any four-part Call of Duty DLC co-op experience is always a little dry. It leaves room for the excitement to expand as more content drops. Lovely, isn't it? The phrase "Rose McGowan's signature wit" comes to mind before dissolving into a cloud of uncertainty. I've barely scratched the surface of the Exo Zombie mode. I plan on playing it as much as I possibly can today, if only to look busy so the other Kotaku people in New York City this week think I'm really productive. Then I can go home on Saturday and resume my regularly scheduled mid-day chair naps. Have you played Exo Zombies yet? If so, how do you feel about Rose McGowan's signature wit?